Find out what the standard tuition charge is for U.S. colleges, and how California State University - Dominguez Hills compares. Prepare economically for your college degree. Compare California State University - Dominguez Hills' tuition charges to other U.S. colleges and universities. Check for tuition trends and potential increases to see if you have to allocate more money for the next 4-6 years of tuition. For nationwide, regional and statewide comparisons, look at the table below to see how California State University - Dominguez Hills measures up to other schools. California State University - Dominguez Hills fees and tuition is dramatically lowered for students from California. For in-state students, tuition and fees is set at $6,837 for the 2017 - 2018 year, 63.5% off the price charged to out-of-state students. Tuition is $5,742 and fees $1,095. California State University - Dominguez Hills out-of-state students paid $18,717 in tuition and fees in 2017 - 2018. $1,095 was charged for fees, and $17,622 was tuition. Tuition and Fees for out-of-state students attending California State University - Dominguez Hills grew at an average annual rate of 0.4% over the past 5 years. In the same time period, tuition grew by 0.0% and fees grew by 11.1%. Based on this, we estimate the cost of tuition and fees for this year will total $18,797. For a two-year degree, we estimate tuition and fees will be $37,676 and $75,676 for a four-year degree. This does not include additional costs for example room and board, books, and transportation. 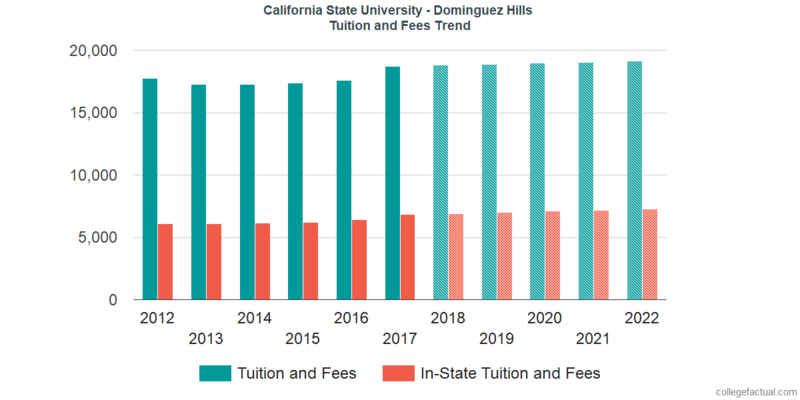 The following chart shows predicted future tuition and fees which includes residency based discounts for undergrads at California State University - Dominguez Hills. Due to inflation and other factors, the price of college is likely to increase every year. For this reason your final year of college might be much more expensive than your first year.